Naturalistically modeled with a long tail perched on a high tree stump applied with leafy branches. The porcelain animals created at the Meissen manufactory between 1730 and 1736 represent one of the most ambitious commissions in the history of European ceramics. Around 1725, Augustus II, elector of Saxony and King of Poland, conceived the bold plan to convert a Dresden residence, known as the “Japanese” Palace, into a magnificent setting for the royal ceramics collection. The ground floor rooms were to showcase more than 25,000 pieces of Chinese and Japanese ceramics, while the upper story was reserved for the porcelain produced at his own factory in nearby Meissen. The most spectacular interior was to be a long gallery, decorated with nearly six hundred porcelain animals. Sixty-nine different species were ordered, ranging from dogs, foxes, and goats to exotic elephants and monkeys, and even three mythical creatures. These large animals, some life-sized, stretched the technical and artistic limits of the porcelain medium, only recently discovered in Europe. 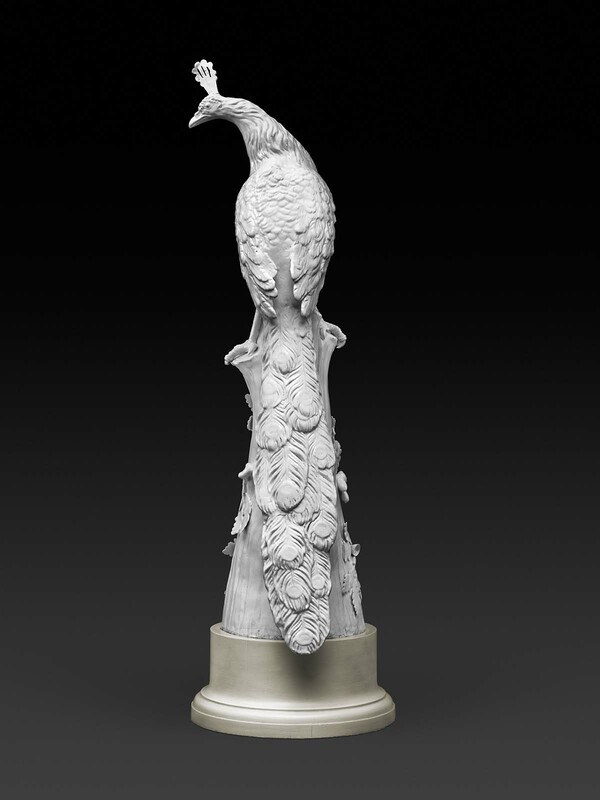 In spring 1734 the sculptor Kändler supplied two different models of the large peacock-one seated on a tall tree stump, the other displaying its fan. The seated model posed a considerable technical challenge, not only because of its exceptional size, but also because the long tail was vulnerable to damage in the kiln. Only three examples of the seated peacock are now known; the two others remain in the Porcelain Collection in Dresden. The production was such a drain on the factory’s resources that the last orders were placed in 1736 and the scheme abandoned entirely by 1740. Still, Meissen delivered more than five hundred sculptures in less than ten years. This peacock belongs to a group of eight animals recently acquired by the Museum of Fine Arts through gift and bequest from New York collectors Edward and Kiyi Pflueger. Augustus II (“the Strong”) began building the Japanese Palace in Dresden in 1725 and commissioned more than 35,000 porcelain works from the nearby Meissen porcelain manufactory to furnish his "porcelain palace." 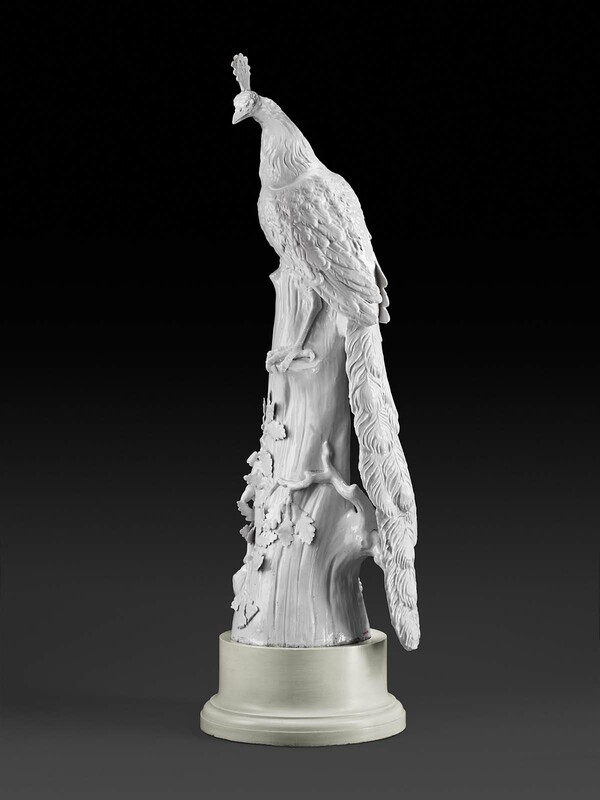 The original collection featured more than 500 large bird and animal figures; among these were 37 animal species and 32 bird species. Augustus II died in 1733 and his son Augustus III took over the project. The Japanese Palace became a museum and library after the death of Augustus III, and parts of the collection were sold and traded in the 18th and 19th centuries. This peacock was shown as item 56 at the 1955 exhibition at the Kunsthaus, Zürich, by the Keramic-Freunde der Schweiz, "Schönheit des 18 Jahrhunderts," and illustrated in the catalogue; at that time the peacock was the propoerty of the Lucerne art-dealer Otto Buel.